The other evening, after listening to some hipster Romanian music and visiting a photography exhibit at the MACRO in Testaccio we were not quite ready to head back home. It was dark and felt late, but it was not even 7pm. I had remembered seeing some new cocktail spot that had recently opened being talked about on Facebook and while I was looking up the name I realized we were actually standing right in front of it. 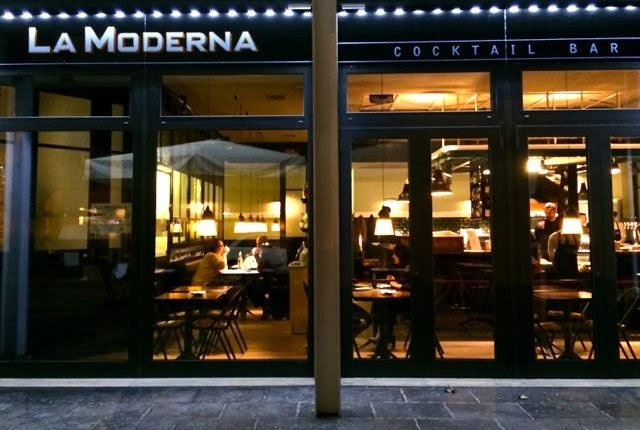 La Moderna is in the complex where the new Testaccio market is located. 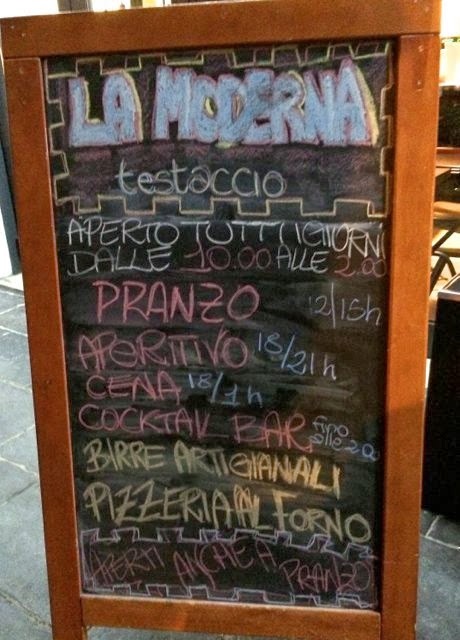 Since we arrived at that awkward hour just before polite aperitivo hour and hours before dinner, there were tables with young families with strollers having a snack and groups of girlfriend drinking pots of tea. As the evening progressed the place filled up with stylish young Italians. Polite or not we were in holiday mode so we ordered cocktails. 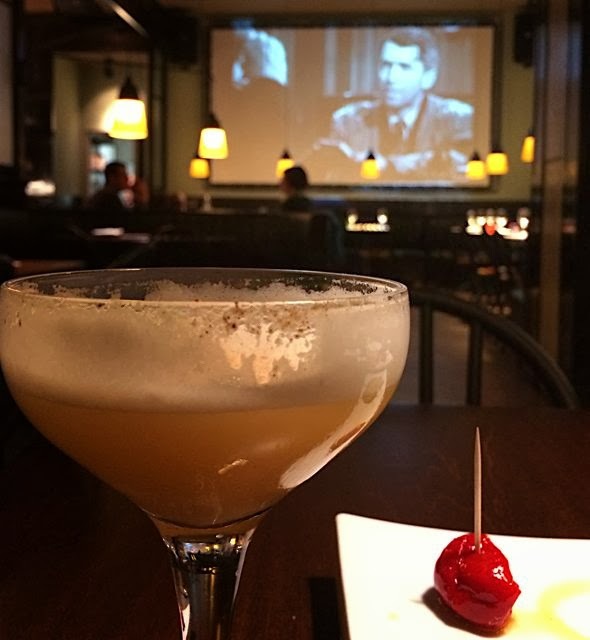 The Quercia e Amore is a twist on a whisky sour made with bourbon with a light, frothy top. A smoky and bitter Nero e Nero with chinotto and rhubarb bitters went down very quickly. A very nice plate of snacks was delivered with our drinks. 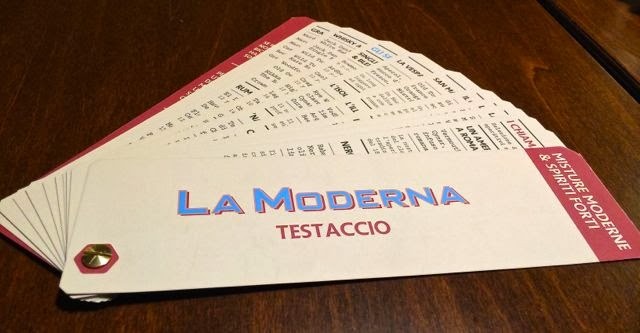 Things like Tuscan crostini, tiny dishes of fagioli di fiasco and a most excellent ceci e baccala. We decided to stay for a quick dinner and ordered from the gourmet hotdog menu. 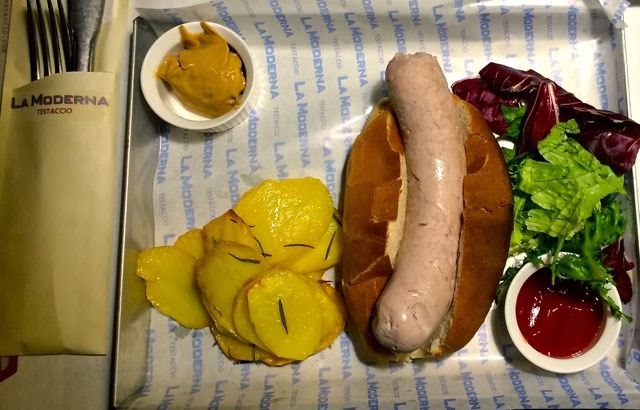 Delicious german style sausages in nice rolls and plenty of mustard. Add It's a Wonderful Life playing on the large movie screen and a soundtrack of Frank Sinatra and it made for a a wonderful late December evening indeed. Looks fab, thanks for the tip!